The CW fall 2018-19 schedule doesn’t include any new superheroes—unless you think witches, vampires and werewolves belong in that group. 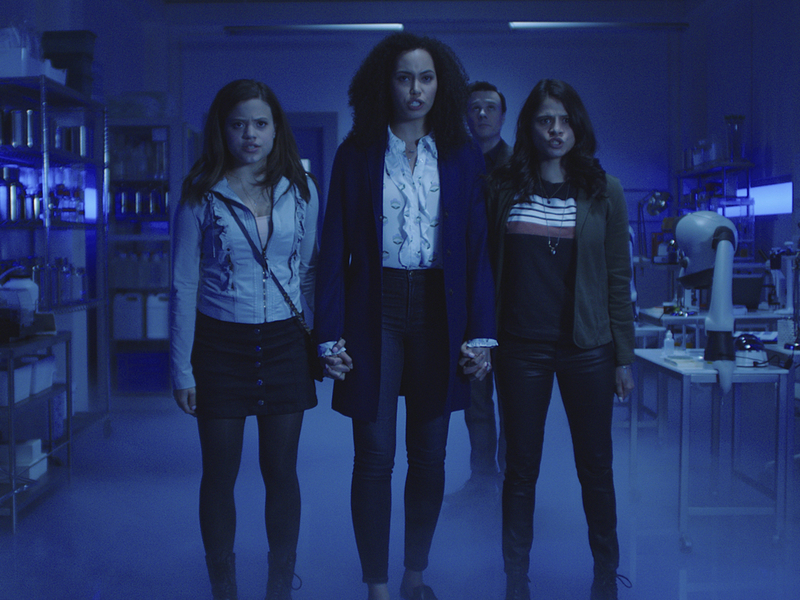 The network will debut two supernatural series, Charmed and Legacies. “Charmed” reimagines the 1990s drama about three sisters who happen to be witches. “Legacies,” from the makers of “The Vampire Diaries” and “The Originals,” continues to tell the stories of the families from those two shows. The CW’s third new fall drama, “All American,” is about a high school student who is gifted, but not with superhuman or supernatural powers. He’s just a great football player. So great that a coach from a fancy high school in Beverly Hills wants to bring the kid to his team. But moving from the inner city to a wealthy area proves difficult for many reasons. Two other new shows on the CW fall 2018-19 schedule—“Roswell, New Mexico” and “In the Dark,” will premiere at midseason. You can read more about all the new shows below. “iZombie,” “The 100” and “Jane the Virgin” also return at midseason. The world of sisters Melanie and Maggie Vera are shattered when their mother, Marisol, dies in a horrifying accident. Or was it? Three months later Mel is unable to accept the official explanation of their mother’s death, while Maggie accuses Mel of being morbidly obsessed. The sisters get another huge shock when they learn they have an older sister, brilliant geneticist Macy, whom their mother kept a secret. With the emotions of all three sisters running high, each of the girls suddenly exhibit impossible new abilities: Mel can freeze time, Maggie starts hearing others’ thoughts, and Macy has telekinetic powers. There’s a perfectly reasonable explanation … or so says Harry Greenwood when when he reveals to the sisters they’re actually powerful witches, as was their mother. As their “Whitelighter,” Harry is there to guide and advise them. He also explains that their mother’s death was, indeed, murder. It’s a lot to take in, but ultimately the sisters accept their new destiny as The Charmed Ones and their new duty to protect humankind from the demons that walk among us—one of whom killed their mother. With the Power of Three, they are stronger together even if they have no idea what they’re really up against. Executive team: “Charmed” comes from CBS Television Studios in association with Propagate Content. Jessica O’Toole, Amy Rardin, Jennie Snyder Urman, Ben Silverman, Brad Silberling and Carter Covington executive produce. Spencer James is a rising high school football player and A student at South Crenshaw High. Compton is the place he calls home. When Beverly High School’s football coach Billy Baker recruits him to join his team in Beverly Hills, Spencer’s mother, Grace, and his best friend, Coop, convince Spencer it’s an opportunity he has to seize. Now Spencer must navigate two worlds, the south side neighborhood that he knows and the affluent Beverly Hills world that has offered him an opportunity for something bigger. When Spencer is forced to move in with Billy and his family to protect his transfer permit to Beverly, Billy’s son, Jordan (the team’s starting quarterback), is less than thrilled to be sharing his father’s attention and the team spotlight with Spencer. While Spencer struggles to find his footing, he makes an unlikely friend in Jordan’s sister, Olivia, who is dealing with her own demons. He also quickly develops a crush on his classmate, Layla, something her boyfriend, Asher, quickly realizes. He sets out to drive Spencer off the football team and out of Beverly Hills for good. Inspired by the life of NFL player Spencer Paysinger. Executive team: “All American” is from Warner Bros. Television and CBS Television Studios in association with Berlanti Productions. April Blair, Greg Berlanti, Sarah Schechter and Rob Hardy executive produce. This new drama tells the story of the next generation of supernatural beings introduced in “The Vampire Diaries” and “The Originals.” At The Salvatore School for the Young and Gifted, Klaus Mikaelson’s daughter, 17-year-old Hope Mikaelson; Alaric Saltzman’s twins, Lizzie and Josie Saltzman; and other young adults including political scion MG and the mysterious Landon Kirby come of age in the most unconventional way possible, nurtured to be their best selves … in spite of their worst impulses. Will these young witches, vampires and werewolves become the heroes they want to be—or the villains they were born to be? As they fight to protect their secret, their town of Mystic Falls and eventually the world, they will have to rely on ancient folklore and tales to learn how to battle their far-reaching enemies. Cast: Danielle Rose Russell, Jenny Boyd, Kaylee Bryant, Quincy Fouse and Aria Shaghasemi, with Matt Davis. Executive team: “Legacies” comes from Warner Bros. Television and CBS Television Studios in association with My So-Called Company. Julie Plec, Brett Matthews, Leslie Morgenstein and Gina Girolamo executive produce. While out for a walk with her guide dog Pretzel, hard-living, disaffected twentysomething Murphy stumbles upon what she’s sure is the lifeless body of her friend, Tyson, in the alley outside her apartment. But when the police arrive, including a charming detective named Dean, they don’t find a body. The police aren’t especially inclined to investigate because Murphy isn’t exactly sober when they show up. Murphy is devastated, and is only held back from spiraling downward by her resolve to learn what happened to Tyson. With the help of her roommate, Jess, and Pretzel, Murphy is determined to find the truth, no matter the risk. Even if it means she has to sober up a little. Cast: Perry Mattfeld, Brooke Markham, Keston John, Kathleen York, Derek Webster and Morgan Krantz. Executive team: “In the Dark” is from CBS Television Studios and Warner Bros. Television, in association with Red Hour Films. Corinne Kingsbury, Jon Collier, Ben Stiller, Jackie Cohn, Nicky Weinstock and Michael Showalter executive produce. Roswell, New Mexico is ground zero for those who seek proof that aliens exist. Liz Ortecho left it all behind 10 years ago, after the death of her beloved older sister, Rosa. But with her father ailing, she reluctantly returns to her tourist-trap hometown. When Liz arrives, she reconnects with Max Evans, her teenage crush who is now a Roswell police officer. Their chemistry is instantly electric. But Liz soon discovers a shocking truth: Max is an alien who has kept his unearthly abilities hidden his entire life, along with those of his otherworldly siblings, Isobel and Michael. As the Liz and Max grow closer, she finds it difficult to keep the truth from her best friend, Maria De Luca, and her trusting high school ex, Dr. Kyle Valenti. Meanwhile, a long-standing government conspiracy spearheaded by Master Sgt. Jesse Manes, along with the politics of fear and hatred that run rampant in Roswell, threaten to expose Max and his family, and could endanger his deepening romance with Liz … as well as their lives. Cast: Jeanine Mason, Nathan Parsons, Michael Trevino, Lily Cowles, Michael Vlamis, Tyler Blackburn, Heather Hemmens, Trevor St. John and Karan Oberoi. Executive team: “Roswell, New Mexico” is from Warner Bros. Television and CBS Television Studios, in association with Amblin Television and Bender Brown Productions. Carina Adly MacKenzie, Chris Hollier, Julie Plec, Darryl Frank, Justin Falvey, Lawrence Bender and Kevin Kelly Brown executive produce.